This picture of a model simulating the weakened and divided magnetic field during a reversal should be in the thesaurus when you look up “bad hair day”. If this is anywhere near correct it should be no surprise that the nano compass needles in sediment cores drilled at different places around the globe point to different magnetic north poles and indicate different paths for the pole during the excursions. Imagine trying to navigate by compass on that puppy. Here is a part of the path of magnetic north during the 41kya (thousand years ago) reversal in the opinion of Black Sea sediments from data very kindly provided by Norbert Nowaczyk. the background is the gravity anomaly and seafloor isochrons with some subduction slab Benioff contour depths for good measure. 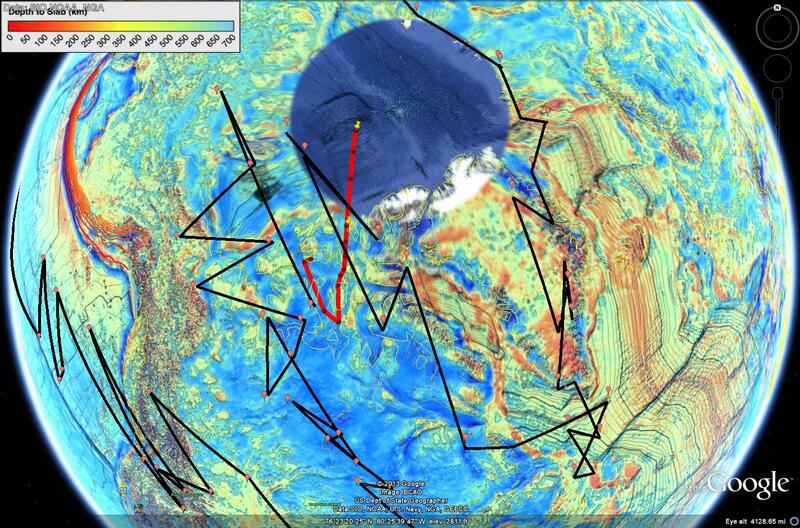 The black path is from Dr. Nowaczyk’s Black Sea data. The view is centered on the Canadian Arctic and the red path is Magnetic North since A.D. 1600 according to NOAA. I’ve discovered a lot more Ocean Drilling Project data for excursions I intend to create Fusion Tables for and plot in Google Earth as time and patience allows. One can see the start and end points for the 41kya excursion very near the modern path. It is also quite clear that jiggy behavior is normal and like lightning the field makes false starts and trial runs before flipping fairly quickly. The 41kya path went off the bottom of the picture all the way to Cuba before backtracking across the U.S. in the lower left. It got out in the Pacific, zigged a bit, and shot down to Antarctica for a complete reversal in the opinion of the Black Sea. Sediments from the Bahamas show a different path that never becomes a complete reversal. We have a lot to learn, but the current northward path of magnetic north is not making my hair stand on end. Bad hair days are when it heads south. This entry was posted in Gravity Anomalies, Magnetic Reversals, True Polar Wander, Virtual Geomagnetic Pole (VGP) and tagged Bad hair days, Magnetic Excursions, Magnetic field, North Magnetic Pole. Bookmark the permalink.